A Facebook post had many dog lovers’ hearts breaking and others even crying at the sorry sight of a puppy with its ears cut off and tied to a tree in Baltimore. BARCS posted the said photo and said they found the abused puppy. BARCS was able to get to the dog in distress after they received a call saying someone found two dogs tied to a tree on Belair Road and Anntana Avenue, along with several other puppies in an empty lot. When the officer arrived at the site, they found the horrific sight of one of the puppies bleeding from the head. Other puppies were there for sale. The puppies were immediately brought to BARC where they were checked on by a vet. 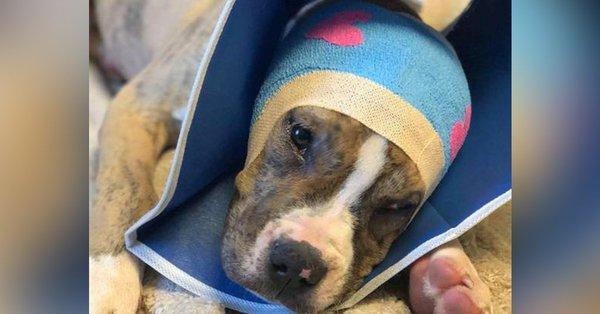 Social media users are naturally upset about the horrific thing done to such an innocent puppy. The injured poor puppy has since been named Claude. The rescuers established that his ears were removed using poor instruments like household objects. The injury left the puppy with tissue damage, pain, and infection. Claude is only 10 weeks old. BARCS said that they can see in the puppy his desire to do normal puppy things but he cannot because of the extreme pain he’s suffering from. Claude already received an emergency surgery but the attending vets needed to remove untreated infected tissue, so the puppy ended up losing more of his ear structure. It is not yet clear if BARCS is pursuing any animal abuse and cruelty charges against anyone who’s done the damage to Claude. For now, they are asking for donations to help Claude further.